Anyone who has had the opportunity to look through the trays of coins and medals at the American Numismatic Society knows that the objects speak. They talk to us as we each have the ability to hear them. They speak to us of times long gone or only recently passed, of important events, and of people: the ones who made the objects, the ones who issued them, the ones depicted or named on them, and the ones who used or collected them. When I go through the Canadian section of the Society’s Indian Peace Medal collection some of the pieces there seem to have things to say about the coming sesquicentennial celebration of July 1, 1867—the day when the three British colonies of Canada (united modern Ontario and Québec), Nova Scotia, and New Brunswick joined together in Confederation and the Dominion of Canada was born (Fig. 1). Every kid likes a good birthday party. Friends, family, presents, and cake are usually involved, so what could there possibly be not to like? However, sometimes as adults, birthdays can become a two-edged sword. While the party might be nice, at times our birthdays can also put us in touch with a sense of our own mortality or feelings of regret that make us uncomfortable. No matter how good the cake is, or how much ice cream is piled on, sometimes birthdays just end up reminding us of our frailties. There will be a big party and a lot of fireworks in Canada this July 1, but for truly reflective Canadians it is going to be one of one of those grown-up birthdays—not a kid one. I have always thought that a remarkable silver medal in the ANS collection (Fig. 2) perfectly symbolizes the three founding peoples of Canada. The medal was struck in France under Louis XV (1715-1744) for distribution to the leaders of Aboriginal allies or to those who had rendered some exemplary service to the French in North America. The medal itself represents the earliest permanent European settlers in what was to become Canada (Port Royal was established in what became Nova Scotia in 1605 and Québec City in 1608) and its unknown recipient, the original people of the land. The medal’s obverse legend, which originally named Louis XV, but was reengraved in 1775 to name King George III of Great Britain, represents the third of the original founders of Canada—the English. Canadian territories claimed by France were ceded to Great Britain in 1763, at the conclusion of the Seven Years’ War (1756-1763). People from many other places across the globe have since come to Canada and have made their unique contributions to the country in the centuries that followed, but Aboriginal, French, and English were the original founders of the country, in that order. The Aboriginal owner of the medal almost certainly had the legend re-engraved to indicate his acceptance of alliance with the British in North America on the eve of the American Revolution and to retain a nice relic of the old French regime—French medals were prized by their Aboriginal recipients because they were generally larger and heavier than most subsequent British Indian Peace medals. It is nevertheless difficult not to think of the re-engraving of the British monarch’s name on a French medal bestowed upon an Aboriginal as a kind of allegory for both the sequence of political dominance in Canada, from Aboriginal, to French, to British and for the building of English Canada on pre-existing Aboriginal and French foundations. 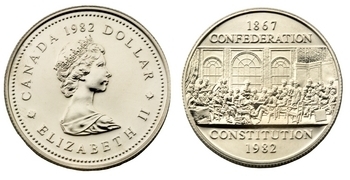 The medal is also allegorical of the serious problem that makes the 150th anniversary of Canadian Confederation such an adult birthday: The colonial powers of France and Great Britain are both given visible form respectively through the medal itself and the re-engraved legend while its Aboriginal owner has left no trace. He is invisible. A lot of things can happen to you when you are invisible. Bad things. To offer only a few examples: Your communities can languish for decades without basic amenities (e.g. running potable water) that would be unheard of elsewhere, but no one else will notice; 40 or more women and girls from your communities can disappear over as many years, but no one will seriously investigate; and mainstream media can make light of appropriating your culture as if you are not even in the room. Even worse, if the intrinsic value of your culture is considered by others to be invisible, it is an easy step to attempts to extinguish it through repugnant educational and social means. The continuing and still largely unresolved burdens of invisibility on Canada’s Aboriginal peoples trace their roots back a long way, to the kind of colonial disregard for the colonized that is reflected in the story of the first medals used to establish treaties between Aboriginal peoples and the young Dominion of Canada. Not long after Confederation, in 1871, Canada negotiated treaties with various Anishinaabe and Mushkego (Swampy Cree) peoples of what is now southern Manitoba (Treaty Nos. 1 and 2) as a means of opening up new land for settlement, while the Aboriginal signatories hoped to gain some measure of protection from an expected ruinous tidal wave of European settlers. By the time of these treaties it was already long-established custom to seal such agreements with the gift of a suit of clothes, a flag, and a medal to the signing chiefs. Canada, however, failed to obtain any sort of appropriate medal for the occasions of Treaty Nos. 1 and 2. Instead, the treaties were solemnized by the distribution of stock medium-sized medals engraved by J. S. and A. B. Wyon of a type that was normally used for prizes in school or at agricultural fairs. The small size and the character of these medals understandably rankled with their recipients—they had signed away vast lands but in return did not receive even the dignity of a medal suitable for the occasion. In an attempt to mollify the resentment, in 1872, the government of Canada commissioned the Montréal silversmith, Robert Hendry, to produce 25 replacement medals (Fig. 3). With a diameter of 95 mm and a thickness of 10 mm the new medals certainly responded to the complaint about size, but they still lacked in dignity. They were not struck from dies prepared for a dedicated treaty medal, but created by silver plating electrotype copies of a Wyon commemorative medal struck for Canadian Confederation and encasing them in 11 mm wide rings. Each ring was inscribed with an English legend identifying the medal as a “Dominion of Canada Chief’s Medal” and the intended recipients as “Indians of the Northwest Territories.” A further piece in the ANS cabinet (Fig. 4) indicates that Confederation medals were also distributed without the additional outer ring, presumably to important Aboriginal figures of lesser status than the main signatories of Treaty Nos. 1 and 2. However, such pieces are not mentioned in the surviving documentation. While the size of the 1872 replacement Chief’s Medal was impressive, its thin silver plating, which had a tendency to wear off, was not. Therefore, at last in 1873, when Canada was preparing to negotiate Treaty No. 3 with the Anishinaabe peoples of what is now northwestern Ontario and eastern Manitoba, proper treaty medals were commissioned from the Wyons (Fig. 5) at a cost of $26 per medal and struck for distribution at the signing of Treaty No. 3 and eight further numbered treaty settlements that were negotiated up to 1921. The objects in the ANS collection are always ready to speak. They regularly tell us of what has happened in the past, but sometimes also invite serious reflection on the present and future that has grown and will continue to grow out of a given past. Sometimes they even have something to say about birthday parties. All we have to do is listen.